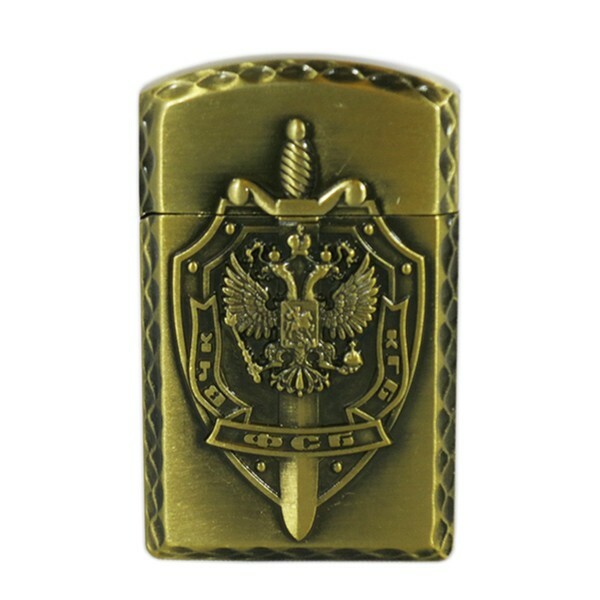 Lighter with VCheka, KGB, FSS Badge, 2"
Lighter is a classic gift which always indicates the status and the style of its owner. The lighter is decorated with VCheka, KGB, FSS badge which is represented by a shield with the coat of arms of Russian Federation, a sword and a ribbon with VCheka, KGB and FSB abbreviations on it. It represents a loyal service to the Fatherland and the people of the nation. The badge is awarded to outstanding employees of these departments. Bronze Lighter Kremlin, Spasskaya Tower in Moscow, 2.25"
Bronze Lighter with Russian Federation Coat of Arms, 2.25"
Lighter and Key Chain with Kremlin, 2"
Bronze Lighter Moscow Red Square, 2.25"